A: Yes, Dry Eye symptoms are more common in the colder months of the year. The air quality changes in the colder months. There is less humidity in the air. Our heaters come on and produce dry heated air. We walk outside and the cold dry air causes our eyes to water a lot. Our eyes can also burn. They can itch. Our Dry Eye symptoms can cause our vision to be blurred so we notice it more also. A: Dry Eye Symptoms can be a result of any one or combination of the following: blurry vision, redness, burning, itching, light sensitivity, excessive tearing/watery eyes, tired eyes/eye fatigue, stringy mucus in or around the eyes, foreign body sensation, contact lens discomfort, and scratchy, feeling of sand or grit in the eye. It is potentially possible to take care of the problem yourself with over the counter rewetting drops when the symptoms are mild. A: During the eye examination additional tests using the biomicroscope will be performed. This will include the Schirmer Test and the tear break up time test. Tear Osmolarity is measured with the Tear Lab, and the tear composition is analyzed with the Tear Scope. The severity is determined by the results of these additional tests. A: Another way and perhaps a better way to describe Dry Eyes is ‘tear film instability’. We have three parts that make up our tear film. The outer lipid layer, the middle aqueous layer, and the inner mucin layer. Overly watery eyes are a result of our tear film not being stable. One or more of the three layers is insufficient. This is the root cause of Dry Eyes. 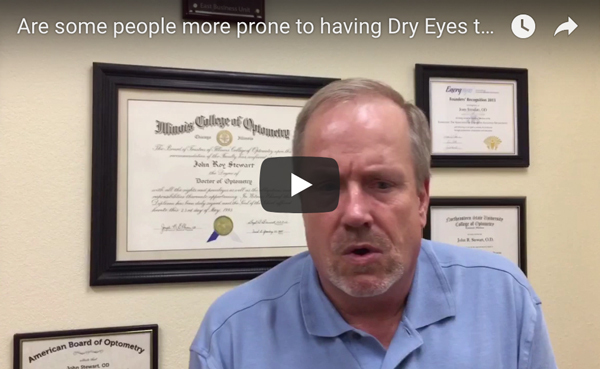 Q: What are some of the treatments used to help people suffering from Dry Eyes? A: The severity of the Dry Eyes determines the treatment we choose. It could be rewetting drops that are sold over the counter for a mild condition. It could be a prescription medicine from the Pharmacy such as Restasis or Xiidra for more than a mild condition. An in Office procedure of Tear duct plugs may be used in addition to the drops. A: Experiencing dry eye symptoms is more common as we grow older, particularly in people 50 years of age and older. Hormonal changes in women who are experiencing menopause or who are post-menopausal. Inflammation in our body can affect the tear gland’s ability to produce tears. Eye or health conditions such as glaucoma, diabetes, lupus, rheumatoid arthritis, and Sjogren’s Syndrome can be associated with Dry Eyes. Environmental conditions such as dry winter air, dry indoor heated air, working on the computer, and wearing contact lenses can cause Dry Eyes. A: Drinking water daily, avoiding pollen, allergens, dry air, dust, and wind. Also blinking your eyes every 5 to 7 seconds making sure that you make full blinks.